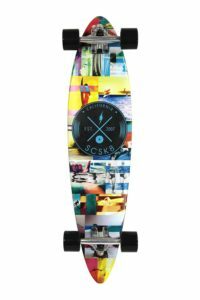 Ready to read the Scsk8 Longboard Review? Longboards have been an ‘in-thing’ from a very long time. It is an amazing means of commute and a great way of work out. Not only will your reflexes get polished, but also increase your body’s strength. It also contributes to the balancing power of your body and exercise for every muscle in the body. Now a question may lurk in your mind that what is the difference between a longboard and a skateboard. Well, longboards as the name gives in, are longer in length. They are also wider that ensures balance during high speed. Longboards are mostly preferred by surfers. Skateboards on the other hand, are shorter and bit curved on both ends built to perform tricks. Longboards may come in various sizes and shapes, but they are mainly made of wood or bamboo. It may come handy to remember that the wider the boards are, the more the balance. That being said, the next question that might shroud your mind is that what is a drop down longboard? It is a longboard with a dropped platform that puts the center of gravity towards the lower side, meaning, it brings more stability to the whole object. Free riders are a perfect match for this shaped longboards. Also, in case if you didn’t know, we have talked about this unit in our longboard mega guide. Here is our Scsk8 Longboard Review, The SCSK8 Professional Speed Drop that you may consider in your list of longboards to buy. Let us take a closer look at its features and benefits. The body of the board is made of 7 ply maple wood to give it the strength required. Its dimensions are 40*9*5 inches, making it 8.5 pounds in weight. The wheels used in its production are 70mm PU Wheels that prevents high jostles and are assembled with 7-inch trucks. For bearings, Precision SCSK8 Abec-9 bearings are used. SCSK8 Professional Speed Drop is made of ply maple wood. Maple woods are the best for making longboards because they are the strongest. The wheels of the board are PU wheels, meaning, they are softer and bigger and help in balancing high bounces. On the other, hand Aluminumis used to make the trucks,hence they do not rust. It also has a SCSK8 Pro Black Grip Tapeon top. Adults, teenagers, beginners, amateurs or professionals anyone and everyone can use this longboard. It can be used by both the genders due to its wide range of color. However, it is not suitable for young children. There are some vibrant colors that are offered by the product. They are: Red, Red Drop Down, Blue Drop Down, Natural, Natural Drop Down, Chocolate Drop Down, Spinnerette and Samurai. All the colors have a glossy finish and burnished look. However, they do not have any graffiti on them except for Samurai. However, because the board comes in one color to give it a funky touch the wheels come in different colors. For instance, the chocolate drop down has green wheels. This creates a blissful contrast to the eyes. Question: Can this board handle 400lbs? Question: How stiff are the wheels? Answer: The wheels are not stiff at all. They have great turning ability and flexibility. Question: Are the trucks replaceable? Answer: Yes, the trucks are replaceable. Question: Do the bearings have spacers? Answer: Yes, they already come with spacers; hence there is no need to buy them. How was our Scsk8 Longboard Review? The Scsk8 Longboard Professional Speed Drop Down longboards are pre-assembled longboards which is great news.The texture of the body has a burnished and glossy look with vibrant colored wheels. The body is well-built with good wheels and strong trucks. Even then the trucks are replaceable and the bearings are modifiable. The whole thing is a good deal for anyone who wants to buy a longboard. The wheels are bigger and flexible, providing good balance while taking turns. It can balance heavy weight on it, but no more than 240lbs. The vibrant colors of the deck make the longboard much desirable and funky. Moreover, it gives the customers option to choose. People from both the genders can use this.However, it does not come with any warranty or replacement offers. If you are considering buying a longboard you might as well keep this in your list. Make out a list of all the things important to you while buying a longboard. See which one matches your expectation. Hopefully, you will find the best one for yourself. Don’t forget to have fun. And Happy Shopping! Youre so cool! I dont suppose Ive learn something like this before. So nice to search out somebody with some original ideas on this subject. realy thank you for starting this up. this website is something that is needed on the net, somebody with a bit originality. helpful job for bringing something new to the internet! Good post. I learn one thing tougher on totally different blogs everyday. It would at all times be stimulating to read content material from other writers and practice slightly one thing from their store. I抎 desire to make use of some with the content material on my blog whether or not you don抰 mind. Natually I抣l offer you a hyperlink on your internet blog. Thanks for sharing.